We’re excited to introduce a new Facebook Ads and HubSpot integration that brings Facebook lead ad creation, tracking, and lead sync to both HubSpot Marketing Free and Paid. This update brings Facebook Ads into HubSpot for no additional cost. It’s separate from the Ads Add-On. The Ads Add-On will remain as a paid feature, it’s the best ads ROI reporting money can buy. This integration is a exclusive to Facebook lead ads. A newer type of ad from Facebook, that was built specifically for an SMB and B2B audience. 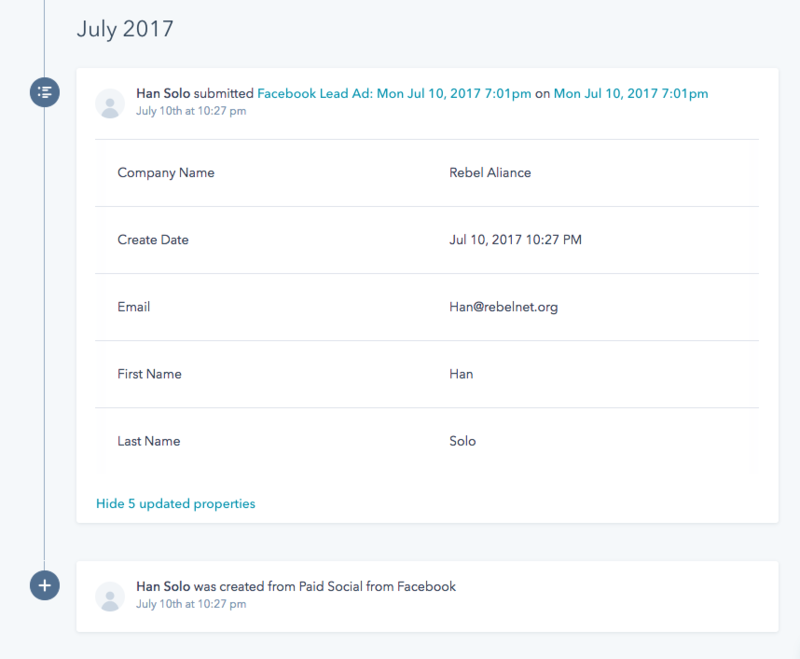 The ads feature a strong CTA, use Facebook data to auto populate forms, and with the integration installed, send these leads immediately into HubSpot. This skyrockets conversion rates for mobile and helps mobile marketing actually work for B2B marketers. Facebook shows your Lead Ads to only the most relevant audience across Facebook desktop, mobile app, and Instagram. Everyone in the world is on Facebook and it’s properties (Instagram, WhatsApp, Messenger). These networks dominate time spent online and Facebook on average now owns 50 minutes of our day. The majority of this time comes from mobile. As much of 80% of all time on Social is from Mobile. But mobile social marketing has notoriously been a hard, low ROI for B2B Marketers. Mobile doesn't convert well with lead forms. Lead ads give marketers access to Facebook’s massive inventory and powerful AI powered targeting, and auto populate forms with Facebook data. Making mobile really work for B2B marketing, better than desktop in some cases. Read more here. Creation - You'll now see an option to create a Facebook Ad inside of HubSpot. . When you chose to do so a pop-up window directly into Facebook Ads will appear. This window is a new kind of integration that Facebook has chosen to launch with HubSpot. It simplifies the creation process, and get’s you right into Lead Ad creation skipping several steps. Once you create an ad, targeting, and set a budget, you ad will show to your chosen audience. You don’t have to have an existing Facebook ads account to get started. Lead Ads help can be found here. Lead Sync - Leads generated from Lead Ads will port directly into HubSpot. This lets you immediately start nurturing hot leads as they come through, increasing the likelihood they close. New leads will look like a form fill in HubSpot. This lets Marketing customers setup workflows to automate lead nurturing from Facebook ads. HSMF users can easily assign these new leads to sales reps for them to call. Measurement - Basic reporting results for Lead Ads in HubSpot. You'll see the reach your ads garnered, contacts generated, and resulting customers. HubSpot Ads is free and separate from HubSpot Ads Add-On. Customers with the Add-On will get both.